A flurry of public works activity will present minor delays throughout most of April. See below for all the details. DeKalb County Watershed will be working on the sanitary sewer line along Clairemont. Two-way traffic will be maintained through lane shifts but minor delays are likely. Level 3 Communications will be installing fiber to service 250 E. Ponce De Leon Avenue. Most of the work will occur on the sidewalk with pedestrian detours as necessary. Motorists are not expected to be impacted. City of Decatur Annual Repaving (LMIG) project, installing concrete curb, ramps, etc. (see map below). Street to remain open to traffic. Delays possible. City of Decatur Annual Repaving (LMIG) project, addressing milling and resurfacing (see map below). Street to remain open to traffic. Expect delays. Road closure with police presence for installation of an A/C unit on the Devry University building. Traffic will be detoured. City of Decatur Annual Repaving (LMIG) Project addressing milling and resurfacing (see map below). Street to remain open to traffic. Expect delays. 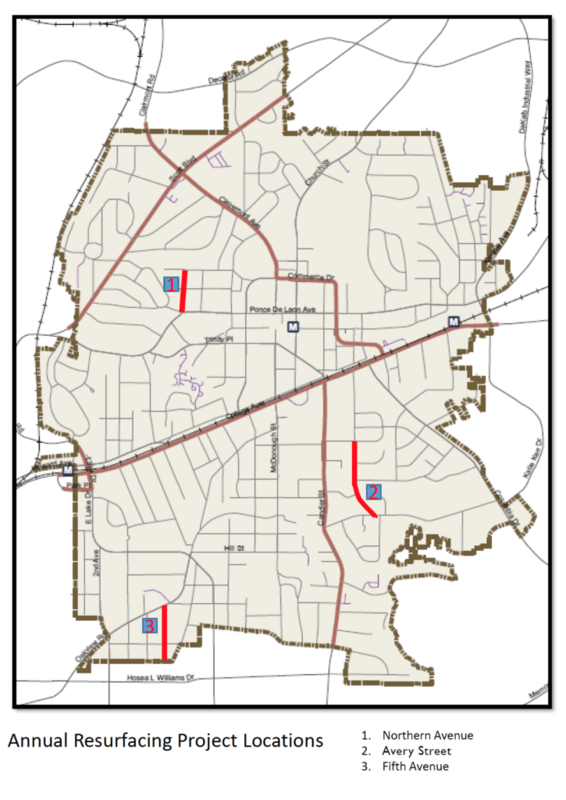 City of Decatur Repaving (LMIG) Project addressing milling and resurfacing (see map below). Street to remain open to traffic. Expect delays. Got questions? Contact Senior Engineer Michelle Hirose at 678-553-6530 or via email here.